Maddy is a ghost, stuck in limbo. Dead from an apparent suicide, Maddy leaves behind her husband Brady and a teenage daughter named Eve. It is a wonder why Maddy would kill herself for it seems she had an ideal life. She was so kind, smart and generous to her family and friends. Brady was a devoted husband to Maddy and is a loving father. And though Eve is currently struggling with the difficulties adolescence, she’s basically a good kid. Maddy may be physically gone, but in the spiritual world, she roams, watching over Brady and Eve both overcome and confused by her suicide. Her death leaves a huge gap in their lives and scars that may never heal. Brady and Eve try desperately to understand why Maddy would leave them in such a heartbreaking, tormenting manner. Was it something they did…or didn’t do? Were there any signs? And if there were signs, why were they so blind to them? Maddy believes one way she can help Brady and Eve is to help them find a wife/mother replacement. Soon she sets her sights on Rory, a teacher whose fun and happy personality can only enhance the lives of Brady and Eve and lead them on a path to happiness and healing. And during this process Maddy is a constant spiritual guide. She tries desperately to manipulate Brady from becoming a rage-filled man who strikes out at his surviving daughter. She also reminds him that being a good man doesn’t necessarily mean being a workaholic at the detriment to his family. At this pivotal time it is of utmost importance Brady be devoted to Eve and help her come to grips with Maddy’s death as well as the usual trial and tribulations of being a teen girl. As for Eve, she misses her mother terribly, and lashes out at her father while at the same time understands that he is her father and loves her desperately. Eve also grows quite fond of Rory and is grateful, not only for her tutoring but for her love and empathy at a time she needs both. But not everything works out so smoothly. Brady and Even often question Maddy’s suicide, wondering if they were at fault. At turns, Brady and Eve are bitter at each other and at other times, content and loving. As for Maddy? Well, her suicide isn’t as clear cut as it seems and as I Liked My Life reaches its compelling end, we begin the understand the complexity of Maddy, Brady and Eve’s lives and how they intertwined. We also are treated to a rather fun, yet unexpected plot twist when it comes to Rory and her life. 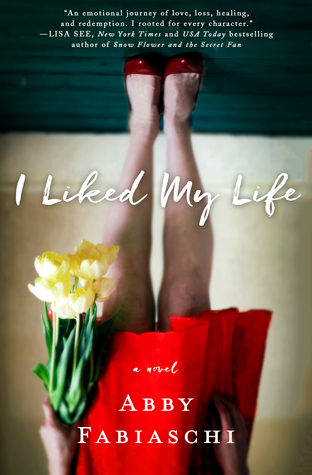 I Liked My life is a haunting tale, one written with grace, dignity, warmth and insight. The characters are both complex and simple. They are people we know and maybe they are us. Fabiachi is a gifted writer and I Liked My Life is a striking debut from a true talent. I look forward to more work from her.